Check-In: Guests are required to provide passport & credit card upon check-in. Special requests: We will try to accommodate requests made in advance when possible, subject to availability and additional charges. Cash -- Please note that there is no ATM service on the island. Guests are encouraged to bring sufficient cash. Credit Cards – Visa, Mastercard, Union Pay (no American Express). Requires signing payment form, and copy of passport & credit card. Ticketing: The resort can reserve your ferry tickets (recommended during high season, bad weather & holidays) and car service (see below). Note: NO outside food & beverages allowed in the villas (for hygiene & pest control reasons). 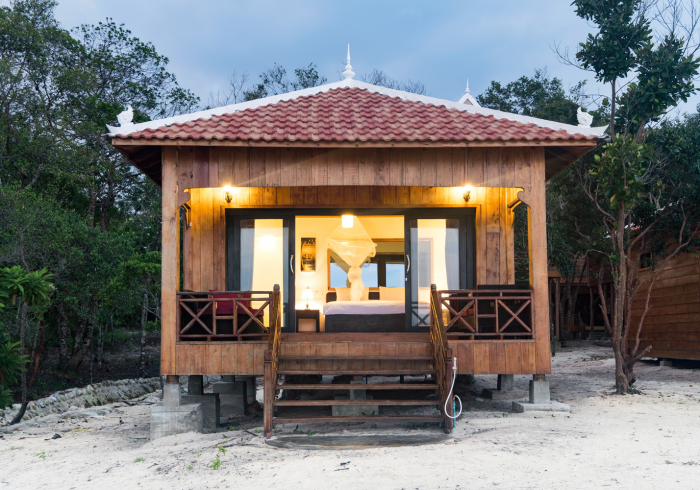 * The resort is located on Koh Rong Samloem island, and accessible by ferry ONLY. Information for updated schedules and rates are available on the ferry companies' websites. * Service is available from/to many locations in Cambodia and the borders of Vietnam & Thailand. * To/from Phnom Penh (airport or hotel) are USD 60/90 for a car/van for up to 4/9 adults. Email us with special requests. Sol Beach Resort is an award winning^ luxury boutique ocean front ALL villa resort, opened in late 2015 and upgraded in 2017. It is simply beautiful & natural, with a quiet and relaxing atmosphere. We are undoubtedly the BEST resort on Cambodia's most beautiful island. We raised the standards on the island and expectations of international guests. The facilities… Beautiful Khmer-styled ALL villa resort with international standard comforts and service. ALL villas have great ocean views! Large comfortable lodge with affordable casual dining, bar, abundant relaxed seating covered open air & outdoor deck. Treat yourself to comfort in paradise! Our Spa offers a wide variety of massages for singles or doubles. Every villa includes: (free) high speed internet, 24hr electricity, air conditioning, hot water shower & bath, and outdoor covered decks. Your safety & comfort are our prime concern! We are the first resort to have: Our own 57m water well with filtration system (other resorts use surface water), all double-chamber (international) septic tank systems (a very important health issue), 24 hour electricity (redundant Japanese generators), fire system resort-wide, all villas with aircon and hot water! ^ Winner of the ASEAN Asia Lifestyles "Best Beach Resort in Cambodia" in August 2017!